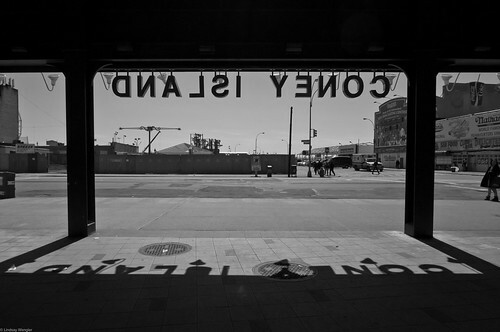 DNALSI YENOC is CONEY ISLAND spelled backwards. The letters frame the view as visitors exit Stillwell Terminal onto Surf Avenue. “After seeing two of my flickr contacts take amazing shots of this within a week, and having taken a photo of it myself, a flickr group was inevitable,” writes photographer Barry Yanowitz, who started the group almost a year ago. Contributors include Coney Island photographers Bruce Handy, Amy Dreher, Lindsay Wengler, agent j loves agent a, and me-myself-i. In recent months, the favorite view of this flickr group has changed irrevocably due to Thor Equities demolition of the century-old Henderson Building and the Shore Hotel. As I commented on Lindsay Wengler’s latest photo in the pool: The emptiness where Henderson used to be is hard to look at, but I also dread whatever Thor will put there next. Buried in today’s NY1 interview with Joe Sitt about the Aqueduct flea market that he’s bringing to his lots on Stillwell Avenue was one sentence about his newest empty lot: “This week he will give the site a new start, laying in foundation for a one-story building to use as an indoor amusement and retail space next summer.” Next summer? What about now? No reason was given for the long delay in construction. As we wrote last week in “Thor’s Coney Island: Building Plans ‘Disapproved’ by DOB” (March 31, 2011), Sitt has yet to break ground because the DOB “DISAPPROVED” the building plans as many as 16 times over the past six months. Sitt also says in the interview that his dream is to build a hotel, but it will take seven years to put in the electricity and the utilities and the infrastructure that’s needed. Sounds like another excuse by the real estate speculator to keep the lot empty. Zamperla managed to build the new Luna Park in just 100 days. Enjoy the view, both present and past. Here is one of my favorites by photographer Amy Dreher. The Fascination sign, which greeted visitors year round for over 50 years went dark and will never be seen again, except in photos and videos. Thanks for featuring the group Tricia! 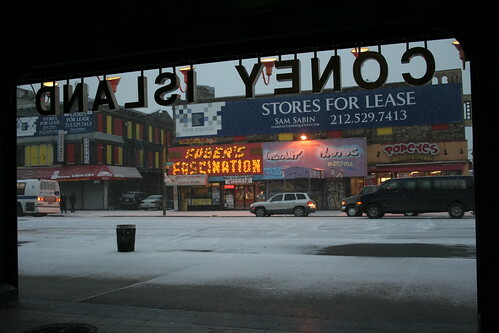 It’s still difficult to walk out of the station and not see the Henderson Building with the Farber’s Fascination sign. Great pictures, but a very disturbing and telling subject. outside the World in Wax Musee and cutting her own spiel off to question a passerby with “Madame, is that baby still breathing?” and then I am fully reminded of the Hammer of Thor crushing so much of that with a 1950s urban renewal/shopping mall mentality & aesthetic–and replacing it with what, a bad version of Caesar’s Bay Bazaar?